I’m pleased to be joined by Jo Fenton today who is sharing her top five recommendations for getting your book written. They have definitely worked for her as her novel, The Brotherhood, was published by Crooked Cat Books earlier this year. There’s also the opportunity for you to win a copy of the book. Then there’s the emotional rollercoaster of wondering how good a writer you are. Personally, I flipped between dreaming about the movie deal (and yes, I’ve cast all my key characters!) and wondering why I was bothering to write, as I didn’t feel able to string a sentence together. So, to help others manage the process, here are my 5 recommendations for getting that book written. If you don’t believe anyone will read your book, you won’t get past any of the hard bits. You have to believe that you will get published and that people will read and enjoy your book. And, yes, feel free to dream about that movie deal – nothing is impossible. Set aside time to write. Most of us have other commitments. It’s okay not to write every day, but try to allocate time most days if possible. There will be times when life gets in the way. It happens. I have a tracker. It tells me to write 700 words a day. If I’m having a tough week with my paid job, I sometimes go several days without looking at my work in progress (WIP). I’ve realised there’s no point beating myself up about it. I delete those dates and shift everything up, so, yes, it will take longer for me to finish, but my tracker does keep me focused. And when things are going well, I’ll exceed my 700 words and catch up. Anyone can write. All you need is imagination and a pen (or keyboard). But to write something that people want to read requires a skill set. Skills can be acquired through reading how-to books, doing a course and/or joining a writing group (more on that below…). Don’t be afraid to start your book again when you’ve learned some skills. Learn what works, what doesn’t work; find your voice; practise and develop your skills. Once you’ve learned how to write, you need to learn how to give and receive feedback. Find the right group for you. If you don’t like the people, or the structure or process of the group, you’ll stop going; or you’ll go and be miserable. This is definitely not good for creativity. Whereas the right group will support you, help you develop your skills and your story; and cheer and give you hugs when you get that publishing deal. To go back to my starting point, writing is hard. If you’re not in love with your idea, you’ll give up long before it’s finished. Persistence and determination are key requirements in writing a book, but you have to believe it’s worthwhile. When you’ve got the choice of sitting at the keyboard to write another chapter, or chilling out on the sofa with that Netflix series everyone’s been raving about, only passion and dedication will drive you towards that keyboard. The Brotherhood met all these criteria. I fell in love immediately with the idea of a psychological thriller set in a religious sect. I wrote a full draft based on that first infatuation. Then I found out about some writing workshops that were starting in Manchester on Saturdays, fulfilling the requirement of being accessible on a day when I was generally free. Those workshops developed into a writing group, with regular critique sessions. The group consists of a set of lovely people who aren’t afraid to speak their minds, but who are sensitive to each other’s feelings. The result is valuable feedback, which has enabled us all to grow and develop our writing. Incidentally, I’m also a member of an online writing group, whose members get together once or twice a year – we critique online sporadically, and offer each other support and chat. Writing can be isolating on occasion. I receive different feedback from the two groups. Meanwhile, I’ve gained two fabulous sets of friends. I’ve already discussed my tracker. I wouldn’t write anything like as much without it. It holds me to account, and made sure The Brotherhood was completed in the time I’d set myself. Finally, the dreams: I’m still fantasising about that movie deal, but several other dreams have already come true. I’ve had an amazing book launch in my local pub, attended by 100 friends and family members (and a few strangers). Articles have appeared in the local press about me and my novel, and I can honestly say I’m a published author. I’m living the dream. When a young woman becomes pregnant in a religious sect, how far will she go to escape the abusive leader and save the people she loves? 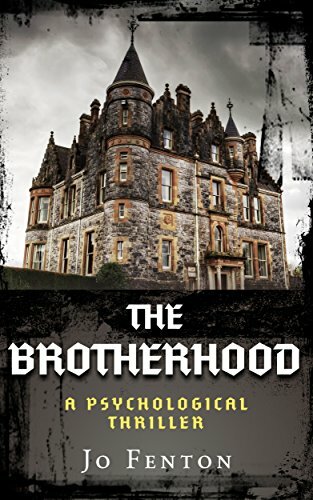 The Brotherhood – safe haven or prison? After her parents’ sudden death, a grieving Melissa falls back on her faith and into the welcoming arms of a religious sect. Captivated by their leader, Dominic, she leaves her old life behind and moves to the countryside to join them. But life in The Brotherhood is not as safe as it first appeared. When engineer Mark joins The Brotherhood, Melissa finds herself conflicted between her growing feelings for him and her crush on Dominic. With their leader’s initial encouragement, Melissa and Mark grow close. But as her haven becomes a prison, Melissa’s newfound happiness is destroyed by Dominic’s jealousy. How can she escape and save the ones she loves? Jo Fenton grew up in Hertfordshire. She devoured books from an early age, particularly enjoying adventure books, school stories and fantasy. She wanted to be a scientist from aged six after being given a wonderful book titled “Science Can Be Fun”. At eleven, she discovered Agatha Christie and Georgette Heyer, and now has an eclectic and much loved book collection cluttering her home office. Jo combines an exciting career in Clinical Research with an equally exciting but very different career as a writer of psychological thrillers. When not working, she runs (very slowly), and chats to lots of people. She lives in Manchester with her husband, two sons, a Corgi and a tankful of tropical fish. She is an active and enthusiastic member of two writing groups and a reading group.